This is probably the post where I should write about Sunday night’s Grammy awards…sprinkling in a little history here and there, and talking about how the Rihanna plus Cold Play collaboration was false advertising since it was just Rihanna and Chris Martin. But what I really want to write about is horseshoe crabs. You see, last week I held a horseshoe crab. For most of us, there are probably a million other animals we’d prefer to hang out with. After all, a horseshoe crab is not exactly cuddly pet material. It doesn’t wag its tail when it’s excited. And it doesn’t purr when you stroke it. But it does have two major things going for it which have made me a big-time fan. Dinosaurs appeared 230 million years ago, 70 million years after the ‘shoes. What’s more, the dinosaurs were extinct as of 65 million years ago. So the ‘shoes have been on planet earth a combined 135 million more years than the likes of T-Rex. I’m no mathematician, but that seems like a lot. Modern-day humans appeared 100,000 years ago. So we’ve been around 0.03% of the time as the ‘shoes. Second, it plays a key role in modern medicine. 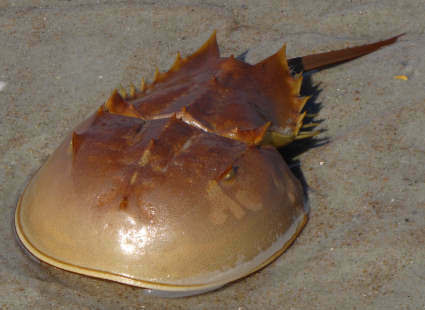 The next time you get an injection and walk away without getting infected from it (which hopefully is par for the course these days), you can thank the horseshoe crab. In the 1970s, scientists began to use horseshoe crab blood to identify if products were contaminated with bacteria — since then, pharma companies have used it for creating safe new antibiotics, vaccines, and medical devices. So next time you see a horseshoe crab turned over, show it some love and give it a flip.